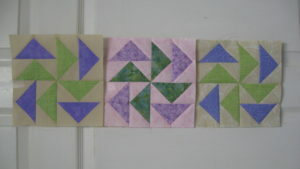 Here’s my 3 blocks made for February. Was a challenge for me finding colors I thought did justice to any of the 3 required and not “kill” or totally overshadow the lighter green nor “get lost” with the darker green. But I like the result. The tan backgrounds aren’t really that yellow-y.